Scholarship recipients will join colleagues in St. Louis in March for either the Diversity and Inclusion Conference or WSA Professional Development Day. Webster Staff Alliance (WSA) has announced the Webster Staff Alliance Scholarship Award, designed to bring up to three domestic extended site staff members to the home campus in Webster Groves, to participate in either the Embracing Diversity and Inclusion: Critical Conversations (March 1-2, 2017) or WSA Professional Development Day (March, 15, 2017). The award will cover the cost for travel (mileage reimbursement or airfare), lodging and food. Why will attending the Embracing Diversity and Inclusion: Critical Conversations event or the WSA Professional Development Day (select one) benefit you personally and professionally? 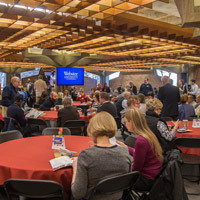 How will your attendance impact your ability to connect across the Webster network? How will attending your selected event positively impact your job performance and benefit your extended site and the students at your campus? Send your application materials to wsa@webster.edu. Applications are due by Friday, Dec. 23, 2016.
Review of applications will take place by the WSA Board. Selection of recipients will based on the strength of an applicant’s personal statement, an applicant’s ability to address the above questions, and the networking opportunities attendance provide to enhance the recipient and their extended campus. All applicants will be notified of final decisions by mid-January 2017.